The weather is stirring things up around here. I'm back to the Quonset in the woods after a drive to Greenbank (where I take myself on a walk) and the beautiful hills that overlook two bodies of the Salish Sea, Saratoga Pass on the east side of the island and Admiralty Inlet on the west. 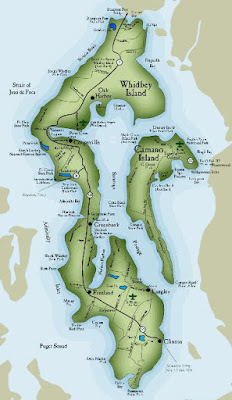 The narrow waist of Whidbey Island makes for very easy access for the winds; they, the winds, can come from any and all directions. Late morning, the winds were blowing from the south at more than 20 mph. That's a stiff blow! When I got to the walking trails the flags were held straight out ... horizontal to the ground. But there was plenty of blue sky, families of different shaped clouds and a temperature that was easy to be in. I prepared for whatever might come, and wore my five year old high top boots. They're well worn, but not worn out and comfortable on my feet. Layered up to be with the winds, I felt supported from head to toe and accepted the weather as it is. In a very real way you don't see the wind but its effects are clear: clouds race, trees dance, flags flap and caps fly if not held in place. I grew up in a valley with a protruding ridge at its back over which the winds could howl for days at a time non-stop. My neighbor next door used to insert ear plugs, pull the blankets over her head and block out the noise to fend against the winds. Strangely, I never consciously registered the wind in Kuli'ou'ou (valley whose name translates one way as 'protruding knee') but remember the rain that regularly filled pots or pans in our old WWII cottage as we all slept together in one bedroom. Perhaps the natural force of the elemental was a balance to the often tumultuous dynamics of life inside the single-walls of our family home? "Invisible support" could easily be the Elemental Gods that are so much the foundation of my Hawaiian ancestors. On the island of Kauai alone, there are names for hundreds of Winds, each of them an akua, a god. Early this morning, just after waking, I finished the last two short chapters in the book Language of Threads written by Gail Tsukiyama. The story is a sequel to Tsukiyama's first novel Women of the Silk, and both follow the life of Pei a young Chinese country girl who at eight years old is taken to work in the silk factory and live in the girl's house. By the time I finished reading the last word of Language of Threads it is 1973, Pei is a woman in her forties. (In 1973, I was a woman of twenty six.) A skillfully woven story will capture the reader's imagination, but, also the reader's heartbeat. Like a clock the heart of the story asks for the reader to be in sync. When the story begins ... "Like all the new girls, Pei had begun in the sorting room. The dim, hollow room filled with cocoons smelled stale and musty. She tried very hard not to ask too many questions of Lin, but every step was like a new adventure, from transporting cocoons on wooden carts from one room to another, to standing behind the long wooden tables sorting out the mountains of white. The girls who once whispered secrets about her now spoke in the same secretive hush with her. Soon Pei could tell a good cocoon from a bad one simply by touch, by the texture and the firmness of it's shell..
As I read the first of Gail Tsukiyama's novels, Women of the Silk, I was reminded of the neighborhood and specific friendships of my own early years. The names of the characters: Pei, Lin, Auntie Yee, Moi drew faces and bodies not only of the women of the silk, but also the faces of people I have known growing up on O'ahu during the 1950's, '60's. Their company the sounds of the names, and the ways in which they engaged or detached from people and circumstance: so familiar in an old and almost forgotten genetic protocol. My heart melted a little, a lot, and my tears flow freely into my pillow. Page after page I read and turned the story and my heartbeat raced when the events arched into one more challenge, another loss. This writing -- here-- attempts in its circling language to ensnare my invisible support. What sources are they? And, what if they come and go without ever being acknowledged? When I am out on the trails I commit to being aware of my footfall; the trails are uneven and to be cautious is wise. I don't walk with a stick for the first time in years and find the strength in my body to be sufficient without it. Thank you, I say to my body and my aumakua (guardians) as I make my way. It feels good to know my body is enough. For the first three weeks of creating a new exercise routine, I was awestruck by the discipline and follow through I had. I was doing it! No one else told me to do it, and do it just this way. I found myself walking the trails I have seen for years from the parking lot of my favorite cafe where scones made with cream and butter lured me with flaky taste. After years of limitation, the logjam was freed up, and I felt good! How come, why only now? On that fateful day, the cafe was closed. Rather than eat and drink coffee I turned to my husband and said, "Wanna take a walk?" Astrologically, the answer could be part of the long (November 2015-September 2016) T- Square between the planets Saturn and Neptune. Hah? Let me try to put this in common and understandable terms. A square means two planets form a 90 degree angle. The square between Saturn and Neptune is almost a year-long transit (the two planets slowly, but steadily, move from this square over the year). Elizabeth Rose Campbell wrote, "Look at any table in the room you occupy right now and marvel at its functionality. Consider the thoughtfulness of its construction, the vertical legs as they meet the horizontal top at the perfect ninety-degree angle that makes it steady." That is the beauty and practicality of a square. Campbell continues with one of my favorite descriptions for a square, "Squares are like speed bumps. Squares are the cautious question: Can I do this if I take my time and navigate carefully?" The tricky thing about a square between Saturn and Neptune is how the support (Saturn) you, me, or any one of us needs/wants during this transit will be invisible, or disappear (Neptune). For a period of time the Universe will be offering us countless (well, you may be counting) experiences with Neptune. Neptune is watery, changeable. What seemed real is not! What was not here a minute ago is back. Elsa Panizzon of Elsa Elsa describes this as the function of 'tide in, tide out'. A function that happens twice a day almost any where on Earth will be experienced in our daily lives more keenly. The effects can be tsunami-like: all that was held dear and stable? Gone. Why do I attempt to frame "invisible support"? Three reasons. First, I have a Saturn and Neptune 'signature' in my natal chart. The planets were sextile or 60 degrees apart when I was born. But like so many aspects of myself I had 'no clue' as to its meaning, until now. Where did this awareness come from? I came slowly and steadily (Saturn) with the years of astrology study beginning in 2008 when Neptune brought a big high tide into my life. The way I was supported was through Faith. Logic wasn't enough (I had a diagnosis for my illness). What I needed was the help of unseen forces. I had faith in something yet to be ... what? I could only see a drawing in the sand, but that was enough. And, it's always been enough is the thing. Neptune is about faith-based reality, knowing without having to see it all before hand. In other words transcending (Neptune) limits (Saturn) is something I've been doing all my life. At this point in life with Saturn and Neptune squaring off to metaphorically and literally make that table top Elizabeth Rose Campbell describes, I am appreciating being tidal. Time is maleable, my ancestors would probably agree that time is a membrane rather than a wall with access to wa i mua o i hope. This is a story of time travelers and values that travel as surely as the moon, in cycles and variation you can count on regular surprises particularly if you are paying attention. One family and their extended 'ohana experience time travel on the illumination of match sticks, splinters tipped with sulphur, and discover how ancient and contemporary truth adapt to survive. This is a journey of visits with old heroines who remain as tangible as basil and tomato red sauce for supper. Polynesian and ancient earth culture season "Splinters" with language and protocol of permissions to invite comfort in any reader with a longing to connect with the feeling of being at home. If you will allow me, I will spin for you a tale kissing with tradewinds. Is there a third reason I attempt this post? Yes. The rains drum on the metal roof above me. Here in the woods on an island in the Salish Sea. A stack of paperbacks books serve me in my exploration of themes or threads to weave, twist and otherwise connect. Rain water, different than the Ocean's water but eventually one becomes the other. In Hawaiian epistemology, Rain is Kane, one of the primary gods, the giver of life; life-giving-water. The ocean is the domain of Kanaloa. Without them there would be no me, or huckleberries, computers or jets screaming overhead. The ties I twist, the stories I write are medicine. I write for myself to hear the voices and solidify my faith through the discipline. It is fleeting, no doubt. I forget what I have written, but, someone reads them. Invisible support you see? Once upon a time there were two old dears who imagined they could build a different place. And that place they could call home. 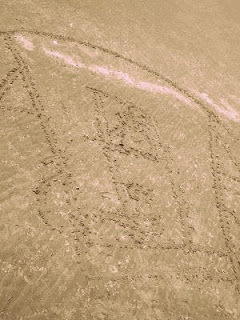 They started by drawing a picture in the sand (Saturn-Neptune). Saturn and Neptune square through September, 2016. I heartily recommend investing $40 (if you have it) in the Transcript "SATURN TRANSIT 12TH HOUSE/SATURN NEPTUNE SQUARE 2015-2016 Workshop Transcript" lead by Elsa Panizzon and Lara (Satori) Harris if you are a student of astrology or have questions about what and where "invisible support" lies in your life. I am in no way associated with ElsaElsa, except as a long-time student, supporter and follower of her work and blog. We have never met in person, I have faith in her and am supported. "Invisible support" again.